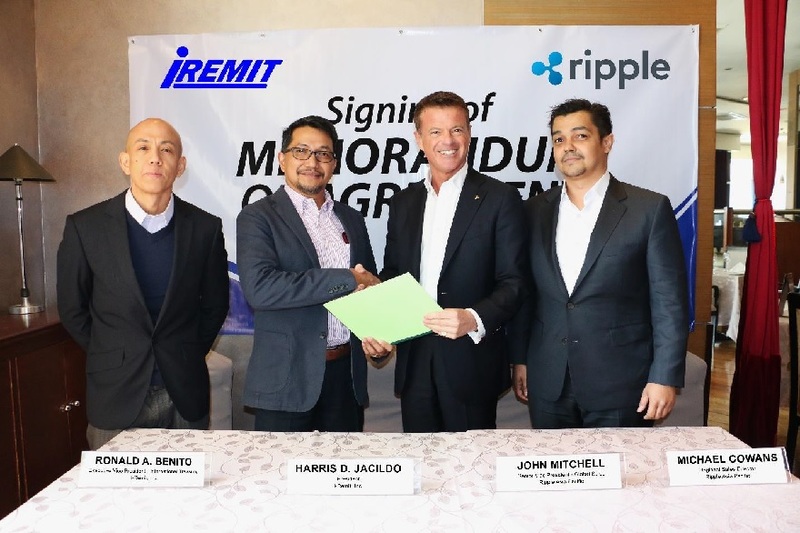 I-Remit Inc. (PSE: I), the Philippines’ largest non-bank remittance company, forged a partnership with San Francisco based fintech, Ripple, on August 15, 2018. I-Remit adopts and integrates Ripple’s block chain cross-border settlements and payments technology solution xCurrent to its infrastructure. I-Remit transactions will move on the rails of RippleNet, a fast expanding global payments network of banks, other financial institutions, and a diverse set of companies and customers. (From left to right) Ron Benito, EVP International Treasury & Head of Digital Solutions, and Harris Jacildo, President, I-Remit; and John Mitchell, SVP Global Sales, and Michael Cowans, Sales Director APAC, Ripple. The adoption of the technology will drive down transactions cost, enhance speed and scale, and minimize fraud vulnerability. The I-Remit-Ripple collaboration is one of I-Remit’s pivotal strategies in achieving industry formidability via digital transformation geared towards boosting customer happiness.